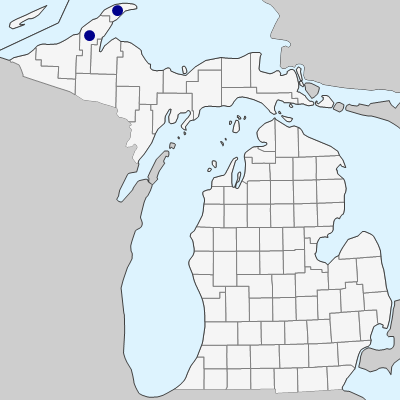 Generally considered to be native well south of the Keweenaw Peninsula, where O. A. Farwell collected specimens over many years, the first in 1895. Presumably escaped from cultivation. The circular disk of uppermost connate leaves, combined with very glaucous leaves (including upper surface of that disk) and tendency for the inflorescence to be separated into 2 or more whorls, make this a rather distinctive species among our climbing honeysuckles. MICHIGAN FLORA ONLINE. A. A. Reznicek, E. G. Voss, & B. S. Walters. February 2011. University of Michigan. Web. April 20, 2019. https://michiganflora.net/species.aspx?id=725.